This site was a wonderful challenge. Funded by University of Middlesex and the social business sector, I had a number of masters to please. Thankfully they were all lovely people, and our meetings were fun and focussed. The clients had gathered loads of useful information and written lots of highly specific reports in the Social Firms sector; they needed a tool to let anyone interested in the sector to filter through the collection for the information most useful to them. Ta-da!! 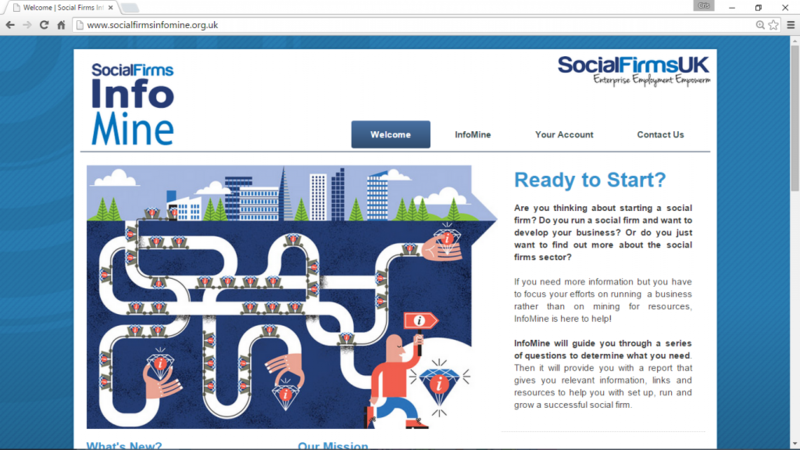 The Social Firms Info Mine. The website guides visitors through a set of simple questions to gather details of where they are on their business journey. Each question affects the next question and at the end, they are presented with a list of documents that relate to their situation. The whole thing is a database driven application that is easily maintainable by the client. So much that they have never come back to ask for changes or fixes. Part of my deliverables was a clear and concise instruction manual.